The AVO 22 released in 2018 is a re-release of the AVO 22 which was originally released in 2002. Why 22? The cigar is a tribute to the day of the month Avo Uvezian was born on, the day of the month his sister was born on, and the day he came to the USA, a 22nd. 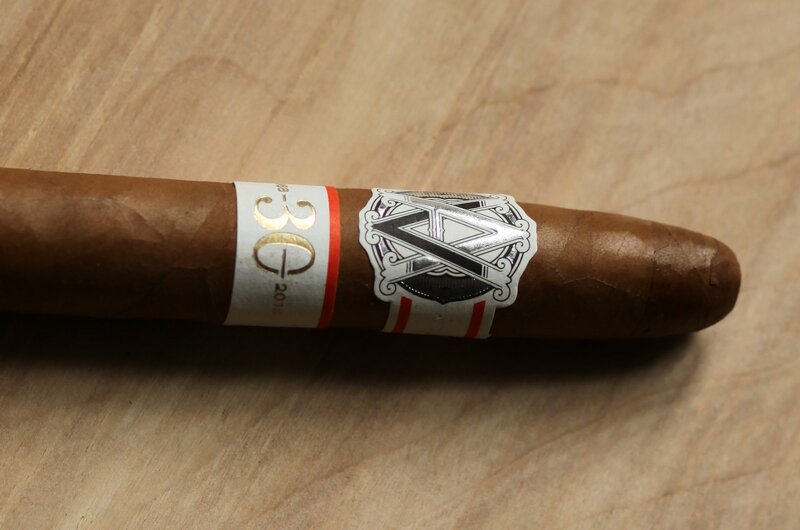 The cigar comes on the heels of the Avo Improvisation 30 Years, a cigar that was highly anticipated but (for me) fell flat. The Ecuadorian Sun Grown wrapper has a couple of major veins but maintains a completely silky texture. There’s a ton of aroma coming directly off of the wrapper: salty spiciness, dry cedar, paper, and peanuts. The bands, as always with AVO, are spot on: an elegant combo of white, black, silver, orange, and gold. After clipping the cigar with a straight cut, I test the draw and find it is fairly restrictive, though I image it will likely loosen up a bit after the tapered end burns through. There’s quite a bit of flavor on the pre light draw, mainly wood and spice, which gets me excited to light up. 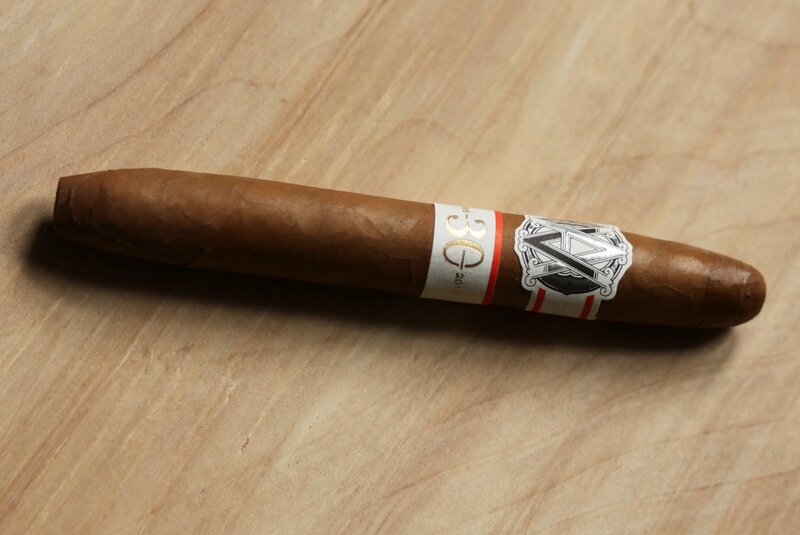 The AVO 22 kicks off with mild bodied, lush smoke. Smoke production is good, and gets even better as the ember burns through the tapered foot. The character of the smoke is interesting: very creamy, noticeably sweet and floral, but with a toasted cedar note that complements the cream out nicely. Touches of spice on the retrohale round the whole profile out. The ash holds for about an inch and a half, which is surprising given that tapered vitolas tend to be a bit more precarious on the construction side. The flavor and strength heading into the second third are both below medium though not quite mild. The flavor has shifted a bit, with the creamy floral note turning into something a bit closer to sweet cake dough. The aroma is also fairly sweet, but has a cracked black pepper note. At this point, the AVO 22 is starting to remind me a bit of the AVO Improvisation 30 Years (one of the few AVO cigars I’m not fond of). The difference here is that the AVO 22 seems much more thought out, with more flavor and complementarity. The final third is where this cigar gets more interesting. The black pepper note ramps up a bit, and there’s also a new flavor, something like lemon meringue that’s subtle but definitely there. The creaminess in the texture fades quickly, replaced by a dry cedar texture. In the last inch and a half, the strength ramps up to medium, with the palate dominated by cedar, black pepper and undertones of sweet grass and floral. I can see why the AVO 22 was so popular when it was originally released all those years ago. It has a lot of finesse, even though the flavor profile doesn’t change radically throughout the course of the smoke. At around $17, this cigar has some tough competition. But it’s worth purchasing, and, if you’re an AVO enthusiast, maybe purchasing a box. Fun little kicker here. Avo Uvezian was a masterful piano player. He’s known for having played with Frank Sinatra and written many of his own tunes. I found out just tonight while writing this review you that you can listen to the man himself play by searching Avo Uvezian on spotify.